Anti Money Laundering (AML) and Combating Financing of Terrorism (CFT) is a very important regulatory compliance across the globe. With the ever increasing terrorism, it is critical that all employees of BFSI sector and those mandated by law to monitor AML/CFT should be aware of the regulations. 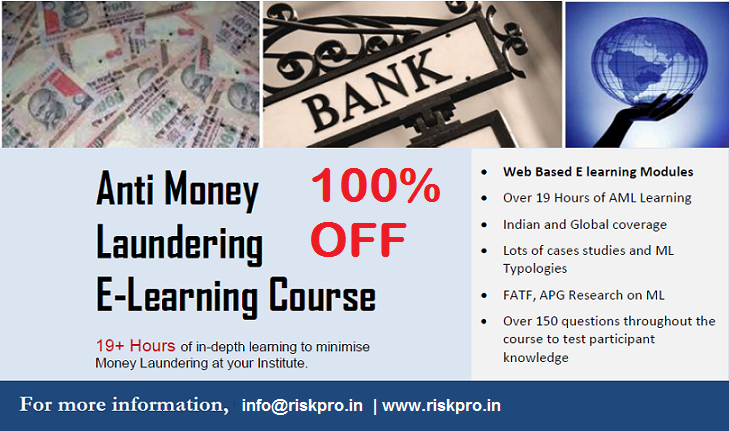 Against this backdrop, Riskpro India is offering Anti Money Laundering E Learning course and related certification exam. This is 100% free and the free course is available till December 2016. An email with login details will be sent. You can then take the AML course online. This is 100% E Learning. Please wait for 5-7 days for us to register your interest. Once you finish the course, you can take the exam. Drop an email to info@riskpro.in once you are ready to take the exam. On clearing the exam, Riskpro will issue a soft copy certificate. Please allow 5-10 days to issue the certificate. Once you are a Guru, help your organisation to fight against terrorism. Do your small bit in the "Fight Against Terrorism".